Strange how the brain can work, a resident of Oregon went to the dentist for surgery and awakened from sedation speaking in a British, or somewhat-British, accent. 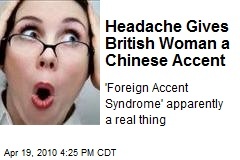 Doctors claim this as a Foreign Accent Syndrome which is caused by a stroke, and also can be caused by a blow to the head, brain hemorrhage or multiple sclerosis. See how the 56 year old woman says "stayed out all night" before and after the surgery. Before surgery - here and after surgery - here. However this is not the first incident. A Norwegian neurologist had documented the most well-known case of foreign accent syndrome: a 28-year-old woman in Oslo who was hit by a bomb fragment during World War II and woke up speaking, of all things, in a German-like accent. Read more about it here. The World is Buzzing Harold Camping, Who is He? What does Real Beauty mean to you? Angry Birds at its BEST! Bing + Facebook = Google? Login to Facebook via Iris Scanner! The way you Sleep can make you ill! How do you sit when you use a Laptop?